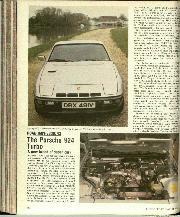 Motor Sport has not been over-enthusiastic in its reaction to the front-engined, water-cooled Porsche 924. In our opinion it lacks a truly sporting character ("A VW trying very hard to be a Porsche", was how W.B. described it) and has deficiencies in the noise, vibration and harshness department, though the latest cars are much improved. I confess to having approached the contemporarily logical derivative of the model, the 170 b.h.p. 924 Turbo, with a certain amount of cynicism. 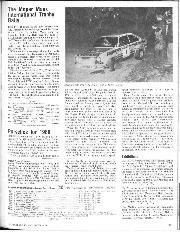 The Turbo impressed with what I described as "stupendous performance" on the Press Launch in Germany in late 1978 (Motor Sport, December 1978), but still "lacked any sort of lively character — perhaps too vice-free?" Nor did further acquaintance on the UK Press Launch last Autumn leave any lasting impression of the Turbo being exceptionally desirable. How wrong I was! After some 900 miles with the road test car (DRD 823V, not the car illustrated) I was almost as loath to hand it back to Porsche as I am 911s. The 924 Turbo is not perfect, but it supremely fast, extraordinarily economical in relation to its performance, practical, conifortable and at times even very exciting. Here, then, is a VW which has grown up into a Porsche, though Dr. Ferdinand forbid that it should ever be the direct replacement for the unsurpassed 911. One thing should be made clear from the start: the 924 Turbo represents a complete revision of the standard car, not a bolt-on conversion. 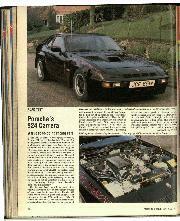 There is clear justification for the price of £13,029 against £9,582 for the standard 924 Lux. It is a high price, perhaps, only £2,480 less than the desirable 911SC without adding the optional sunroof, standard in the 911, but if price against performance and a quality of finish which at best almost matches that of the SC (apart from some paint blemishes on the trailing edge of the test car's bonnet) is taken into account, it is reasonable. The Turbo uses a combination ot KKK turbocharger, boosting at a maximum 10 psi, and Bosch K-Jetronic fuel-injection to extract an extra 45 b.h.p. 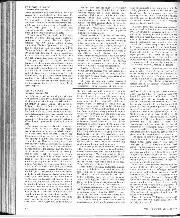 from the 1,984 c.c., in line, four-cylinder, s.o.h.c. engine: 170 b.h.p. at 5,500 r.p.m. against 125 b.h.p. at 5,800 r.p.m. for the standard car. Torque is increased from 121.5 lb. ft. at 3,500 r.p.m. to a hefty 180 lb. ft. at the same revs. All that remains of the standard engine is the belt driven camshaft, crankshaft, conrods and block. The Zuffenhausen built and dynamometer tested turbo engine has a radically altered aluminium cylinder head, with the platinum-tipped spark plugs moved from the exhaust side to the inlet side and the eight larger valves raised into the head to give more combustion chamber volume above the bowl-shaped piston crowns. The compression ratio is thus reduced to 7.5:1 Contactless, transistorised ignition is fitted. Transmission, suspension and brakes are changed from stem to stern. The 8.86" forward-mounted clutch from the 911SC, with lower hydraulic operating forces and automatic adjustment, drives through a larger diameter, torque-tube enclosed propshaft to a beefier five-speed transaxle, with stronger mainshaft, differential and driveshafts. The five-stud (instead of four-stud) hubs and wheel bearings are from the 911SC, ventilited disc brakes are from the 911 at the front, 928 at the rear and use 928 fully-floating calipers. Cooling of these big discs is helped by the distinctive, spidery and extremely awkward to clean, 6J x 15" alloy wheels (the standard 924 uses 14" wheels), shod in the test car's case with 185/70 VR 15 Pirelli CN36 tyres. A rather too far forward handbrake lever, positioned on the floor to the right of the driving seat, operates small drums within the rear brake discs. McPherson strut front and semi-trailing arm rear suspension is retained, but the dampers, front coil springs and transverse rear torsion bars are uprated and anti-roll bar diameters revised. An extra 50 kg. weight (up to 1,180 kg. ), 29 kg. of which is on the engine installation, partly dictates these changes. Distribution is an ideal 49 per cent front/51 per cent rear, or 44/56 fully laden. Minor exterior alterations have transformed the rather Plain Jane appearance of the standard 924 into something much more purposeful. Four ducts in the top of the nose and a NACA duct in the top of the bonnet keep down underbonnet temperature, a rubber tail spoiler, responsible for a three per cent improvement in drag coefficient, is attached to the glass hatchback, there is further ducting beneath the nose for an additional oil cooler and brake cooling, full length coachlines following the lines of the wheel arches break up the slab sides very effectively and those intriguing wheels add the finishing touch. The Turbo comes with the full Lux pack as standard, incorporating items like electric windows, tinted glass, a National Panasonic, computerised, stereo radio/cassette player, a rear wiper but no washer, high-pressure headlamp washers, a heated exterior mirror, electrically adjustable by a neat little ball control under the top rail of the door trim, and the small, thick-rimmed, so very comfortable to handle, leather trimmed, 3.3-litre Turbo steering wheel. Tremendous performance is what this 924 derivative is designed for and 0-60 m.p.h. acceleration of just over 7 sec., 0-100 m.p.h. in 18 sec. 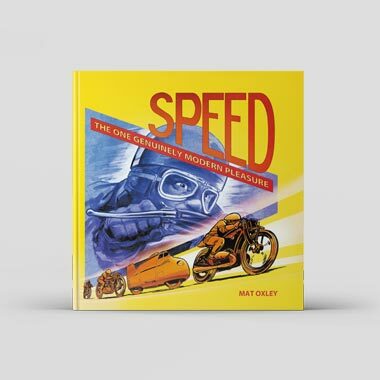 and a maximum speed of over 140 m.p.h. 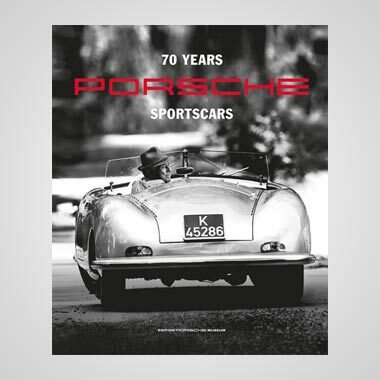 show that Porsche have succeeded in putting this 2-litre sportscar into the supercar bracket. 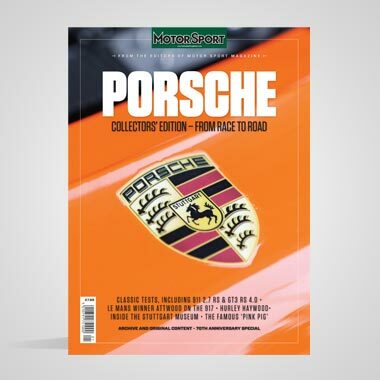 It feels quite sluggish and lazy at low revs off boost, in the higher gears, with none of that instant thrust displayed by the 3-litre 911 engine, but change down a gear or two, take the tachometer needle beyond 3,000 r.p.m. and this turbocharged Porsche surges away in a manner which leaves most other performance cars gasping for breath. Initial response off the line using modest revs is almost lethargic, but first gear is lowered in this Turbo application — rather too "short", with only about 36 m.p.h. on tap — and flooring the throttle incautiously once under way promotes fearsome acceleration, the engine hitting the 6,500 r.p.m. rev. limiter almost before the driver can think about shifting into second. 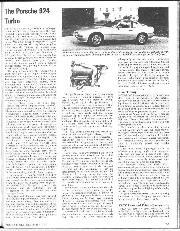 Alternatively, full-blooded, wheel-spinning starts can be made by building up the revs and boost before dropping the clutch; such "cowboy" treatment is not to be recommended in slippery conditions when the accelerator requires more circumspect treatment. The gap between first and the 63 m.p.h. second seems unnecessarily large, but the continuous rush of acceleration as the Turbo is hurried upwards through the gears is a pleasure worth savouring. Acceleration in forth and fifth at motorway speeds once boost is built up is astonishing, and so deceptive is the high speed perforinance that it is all too easy to gallop off into the three figure bracket without being aware. Impeccable high-speed stability and high gearing (24.4 m.p.h./1,000 in fifth) make the Turbo an extremely relaxing motorway express. Yet it is perfectly docile in town, though the driver must learn to anticipate downchanges or he will be caught napping with sluggish acceleration in the high gears. It is a docile and untemperamental car in other respects too, always firing up first time whether hot or cold. 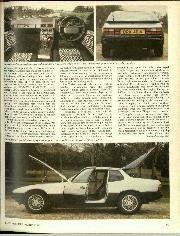 Perhaps one of Porsche's major achievements with the 924 Turbo is the matching of shattering performance to economy. The worst figure I achieved was 19.9 m.p.g. during London commuting. The best figure was 22.65 m.p.g. of four-star on a high speed run to the new TVR Tasmin at Preston. My overall average for some 900 miles worked out at 21.54 m.p.g., exceptional for a car with such performance capability. The 16.4 gallon tank offers a range of over 350 miles. The gearchange, via an unusual, one-piece leather-covered gearlever, can be disconcerting at first, not so much because it has first down on a dog's leg to the left, but because it is spring biased into the 4th-5th plane rather than the central 2nd-3rd plane. Once the driver is used to this idiosyncrasy, the gearchange under most road conditions is delightfully quick, light and accurate. Only when first or reverse is required is the less pleasant feature of a very strong detent spring apparent. For the most part the engine is reasonably quiet, especially when throttled back at steady cruising speeds, but it does become fussy sounding at high revs and is still far from being a smooth engine. The Turbo has increased sound-deadening in areas like the transaxle tunnel, but there remains plenty of scope for refinement in the NVH field, especially in respect of road noise. Wind wise suppression is good, however, which helps with that impressive high-speed cruising ability. Chassis behaviour is at its best on fast roads, when the combination of responsive steering, leech-like roadholding and balanced handling is utterly superb. In twistier conditions the steering feels a shade low geared (it is slightly lower geared than the standard 924), more understeer is apparent and the driver becomes more aware of the different throttle characteristics of the turbocharged engine, sometimes too much power coming in at the wrong moment as the boost comes in, sometimes throttle lag delaying response to a power-on requirement in mid corner, a matter for driver acclimatisation. 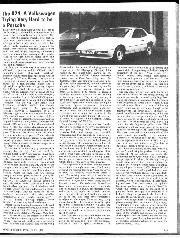 Braking performance is excellent, markedly better than the standard 924, but Porsche have not overcome the dramatic and noisy roughness under heavy braking which I complained about on the German launch in 1978. The ride is firm and creates occasional sympathetic noises in the trim, but it never causes discomfort, partly because of the superb, form-hugging seats. 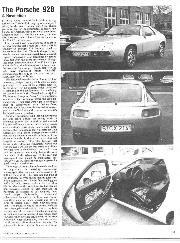 I was most unhappy with the driving position in both the German and UK launch cars, the almost vertical steering wheel seemingly too low, so that I had to drive with the top of the rim, but Porsche GB had removed the spacers from beneath the seat on the road test car and I was happily comfortable. In general terms this two plus very occasional two hatchback is identical to the standard 924 Motor Sport has described in the past. The standard of carpeting and trim is very high, the test car's facia much less cheap looking in black than in the brown colours of previous 924 test cars, the instruments easy to read beneath their conical plastic domes (surprisingly, there is no boost gauge), the high-floored but broad luggage bay covered when necessary with a roller blind. Faults inherited by the Turbo include a poor wiper pattern, which leaves an expanse of unwiped screen on the driver's side, the insistence on key opening for the hatchback and the lack of self-propping facility for the big, heavy bonnet. The heater is powerful, ventilation adequate. This impressive car, at least as quick but more easily drivable because of less girth than the 928, shows the way in which Porsche are thinking for the future of very high performance motor cars. The 210 b.h.p. Carrera GT, a higher performance version of the 924 Turbo scheduled for introduction in the summer, promises to be a revelation. — C.R.